This page explains how integration with MantisBT is possible in Test Collab. While defining the global settings provide the URL, along with Username and Password used to access your Mantis instance. You also have an option of allowing the reported issue to be resolved automatically when the related test case passes by checking "Resolve reported issues when a failed test case is marked as passed". When you check this you will be prompted to provide the status code that Mantis uses for resolved issues, you need to enter the same for "Status code for resolved". project_id (required) : Id of project for which issue is being created. To get project_id open /bug_report_page.php page and view page source. search for "project_id" in page source, value attributes of option tag which follows select tag having name attribute equal to "project_id" are id of projects. select tag are id's of category which can be used here. reproducibility : Similarly like above fields search for select with name attribute equal to "reproducibility" and select values from the options tag. severity : Search for select with name attribute equal to "severity" and select values from the options tag. priority : Search for select with name attribute equal to "priority" and select values from the options tag. handler_id : User id to whom issue should get assigned. Search for select with name attribute equal to "handler_id" and select values from the options tag. view_state : Search for input tag with name equal to "view_state" and enter value attribute information of the view_state. You can also add other fields including any custom field using "Add user defined field" from the drop down, clicking this you will get a text box in place of drop down to enter the name of the field. 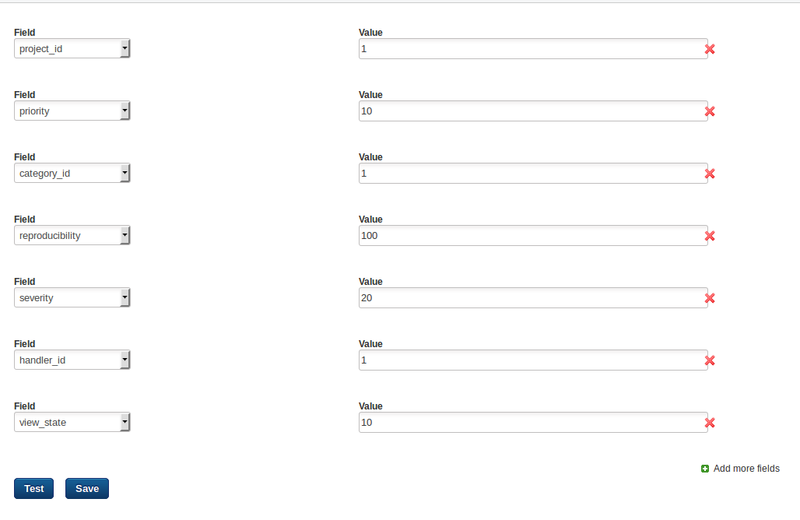 A completed project specific issue manager setting form for Mantis would look like this. Once the values for all fields have been provided you can save and test the settings by creating a sample issue in Mantis.